I'll give you three clues. FDR became president the year before I was born; I was seven years when Pearl Harbor was attacked and WWII began; my brother was four years older than I and he was born in 1930. OK, did you get it? My husband, Stephen Oppenheim and I have three adult children, James, Anthony and Stephanie. We have seven grandchildren, five girls and two boys. Our grandchildren range in age from eight to twenty one. When do you do your writing? I like to write early in the morning when I'm really fresh and rested. That's when I work on my book projects. During the day I also work at reviewing children's products for the Oppenheim Toy Portfolio, so I do a different kind of writing at my office. Do you write books for adults, too? I wear a lot of hats as a writer. I write books for and about children. Every year I write a guide to the best products for children. 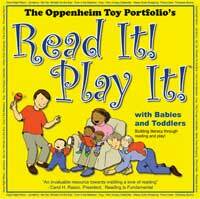 I do this with my business partner and daughter, Stephanie Oppenheim at the Oppenheim Toy Portfolio. We actually do our work by playing with toys-don't laugh! Somebody has to do it. We read all the new picture books, watch the new videos, test the new DVD games. Then we write about the best of them in our annual book. We also put the reviews online at www.toyportfolio.com. We don't sell toys- we just review them. We also write books to support literacy. Our new book Read It! Play It! With Babies and Toddlers is being published in English and Spanish. My kids like to tease me, because I used to work on my bed. Of course, I used to fall asleep and they would wake me up. I really did get a lot of writing there-but that was when I wrote with a pen and paper. Now I work on my computer and I can't do that in bed- not even with a laptop. I used to have Labrador Retriever who was a failed hunting dog he was afraid of all loud sounds, including guns. He was a gentle soul. But that was when I lived in the country. I really don't want a dog in the city. I think it's hard for the dog to be cooped up in a little space. We barely have space for ourselves. Did you have any jobs when you were in school? In high school I ran a dramatic school. I was studying acting and during the summer I worked with younger kids on their speech. I also worked in my parent's home furnishings store. They sold appliances like washing machines, refrigerators, and television. We had a record department so my brother and I got all the records we wanted. One of my jobs was to make bows for gift wraps and my mom tried to get me involved with bookkeeping. But I am allergic to numbers. Before I was old enough to work in the store I liked to earn money by taking bottles back to the grocery story for the deposit money. What kinds of clubs and activities did you enjoy when you were in school? I think I went to school because of the clubs. I played the cymbals and bass drum in band, wrote for the school newspaper, acted in the dramatic club, and organized a radio club that had weekly broadcasts on the local radio. I was in the dramatic club and in all the school musicals. Every weekend I traveled 90 miles each way to take a drama lesson in New York City with Frances Robinson Duff, "Teacher of the Stars" that's what her ad said. In fact, Katherine Hepburn, Clark Gable, and many other big stars had studied with her. I was always sorry that I didn't try to interview all of them and write a book about Miss Duff. She was a character, a very grand lady, from another century. In her townhouse she had an elevator that was operated by hand, with a pulley. Sometimes I got to pull the ropes, but I never rode in it. She had a butler named Pierre who liked like a character from a murder mystery! When I was taking early childhood courses at Sarah Lawrence College, my teacher read children's book to us at the end of each class. Years earlier she had been a classmate of Margaret Wise Brown, the author of Good Night Moon. I fell in love with many of these books and somehow decided this was something I could do. When I graduated, my teacher, Evie Beyer suggested that I join the Writer's Lab at Bank Street College in New York City. In time I was asked to write some poems and stories for the new books they were working on, The Bank Street Readers. They were the first beginning reader books with children who lived in the city, did not have a dog named Spot. In the 1960's they were amazing because they had illustrations with children of color. Schoolbooks before then didn't really reflect our diversity. My first stories were published in those books. Soon after that I sold Have You Seen Trees? , the first of a series of Have You Seen books, published originally by Young Scott books and now by Scholastic. I went to grade school and high school in the little town of Monticello, New York. There were about 3,000 people when I was growing up and everybody knew everybody by name! We walked to school and we even walked home for lunch. It was a cozy place to grow up. The first college I went to, the University of Miami, was almost as big as my hometown. I transferred to Sarah Lawrence College, an all women's school, at that time. It was much smaller and a better place for me. Years later I took my Masters at Bank Street College of Education. Did you ever work at other jobs besides writing? I was a stay at home mom for almost ten years. When my youngest child went to school, I did too. I taught first and second grades in the same school system I had attended, only now it was the big Monticello Central School, where everyone ate lunch in the cafeteria- even the kindergarteners. I wrote a picture book every summer and worked at teaching the rest of the year. When my youngest child went off to college I was offered a job as a full time writer! I moved to New York City and worked for the next 12 years at Bank Street College in the publication department. When you do research do you ever travel to exciting places? Well, it depends what you call exciting? I still find it exciting to go to the big New York Public research library- the big one on Fifth Ave with the big lions. I guess it's silly, but I find that place awesome! 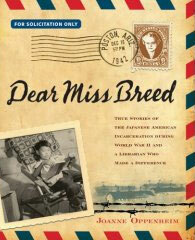 My research for my books about the Japanese Americans has taken me to lots of exciting places, the National Archives in Washington and Maryland; and to California to the Huntington Library in Pasadena, Bancroft Library in Berkeley, and the Japanese American National Museum in Los Angeles. I also have traveled to California, Wyoming, Nevada, and Hawaii in recent years to do interviews for my books.